This is a wonderful original oil on canvas painting by listed American artist, David Birdsey Walkley (1849-1934). 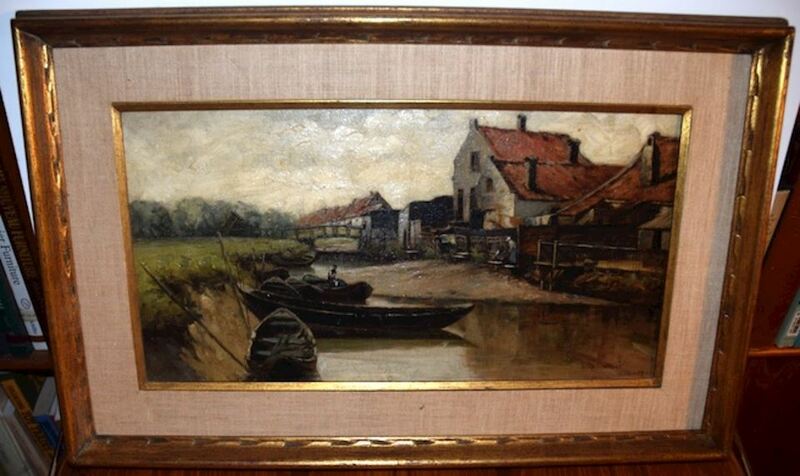 The painting is of a serene river scene and is signed and dated 1887. Asking $1200 (includes shipping), but will entertain serious offers. The painting is in its original gold tone frame. canvas measures approximately 10" x 19". Total dimensions in frame: 15.75" x 24.75". Condition overall is very good. There is one condition issue of note: There is a small pinhole size canvas hole as marked in the posted photo. It is unnoticeable by the naked eye, but can be seen when held up to the light. BIO: David B. Walkley was born in Rock Creek, Ohio, but as a painter is closely associated with Connecticut. From 1867 to 1871 he studied at the Pennsylvania Academy of Fine Arts and briefly had a studio in Philadelphia. In the early 1870s he moved to Cleveland, where he remained for six years. In 1878 Walkley went to Paris to study at the Academie Mosler and the Academie Julian with Gustave Boulanger and Jules Lefebvre. Upon his return to the United States he taught at the Pittsburgh School of Design from 1879 to 1884. In 1884 he married his student May Remington and settled in New York, continuing to study at the Art Students' League with William Merritt Chase. In the late 1880s Walkley himself became a teacher at the Art Students' League. At the turn of the century, however, he was looking for a new place in which to paint and raise his family. He spent brief periods in Port Chester, New York, and Cos Cob and Falls Village, Connecticut before settling in New London. In 1902 he moved to Mystic, joining Henry Ward Ranger, J. Eliot Enneking, and Charles Davis. He helped found the Mystic Art Association, and painted in Stonington, Noank, and Mason's Island. By 1926 Walkley had returned to Rock Creek, Ohio, where he died in 1934.